A couple weeks ago, I wrote a review about DMC’s new floss, Coloris. One question that came up in the discussion of this new variegated thread from DMC was whether or not a list of corresponding solid DMC colors was available for color matching. Welllll….it so happens, there is! 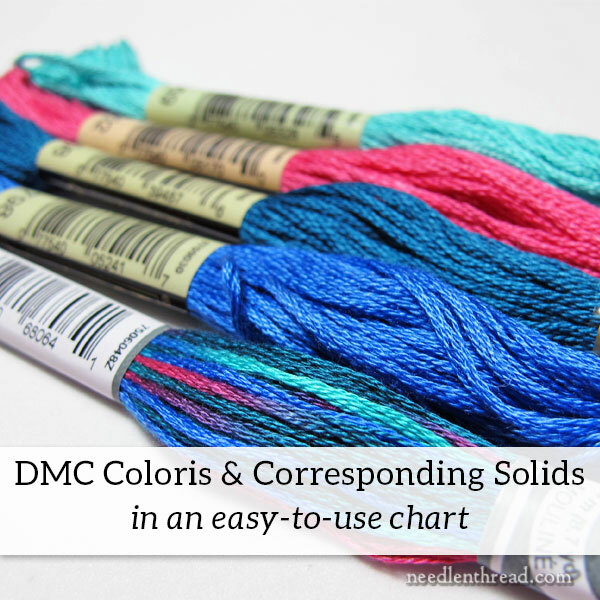 Thanks very much to Sue, a reader here on Needle ‘n Thread, who sent me a link to the list posted by DMC to their PDF with the corresponding solids listed. I took that list and reformatted it for easier reading. Coloris #4520 is missing from the list (it’s the combination of Christmas colors), so I’m going to color match that myself and fill that in for you. You Can Color Match for More Shades, Too! A couple weeks ago, I started color matching some of the colors in the skeins of Coloris with my own DMC threas, to find corresponding colors. It takes a lot of time, but it’s a Very Satisfactory exercise. I ended up stumbling upon lots of color families and shades within them that work well together. When I compared the list from DMC to some of the groupings of solid colors I had put together to match the skeins of Coloris, I wasn’t that far off in my selections. I found that you don’t have to be perfectly precise with each color or shade, to find a satisfactory match. 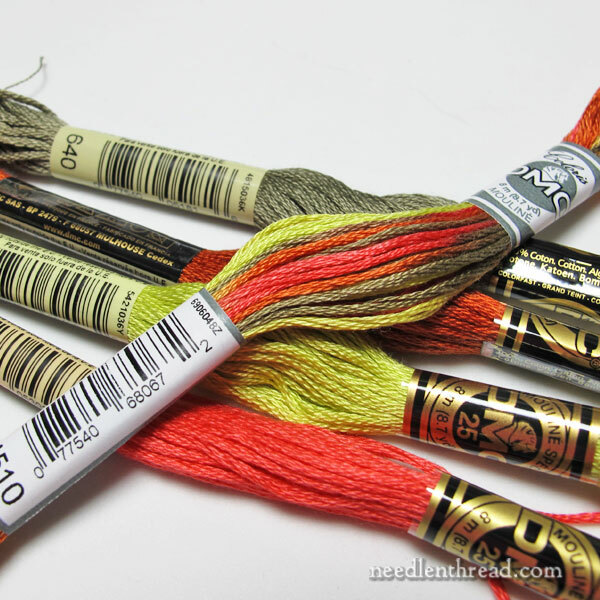 For example, in the photo above, the rusty orange (behind the Coloris skein, second color from the top in the back) is not the same rusty orange listed on DMC’s list. But it works fine. The moral of the story: feel free to experiment with color matching if you’re playing with Coloris. You might, for example, pick out several shades from the color families listed on the chart below, to add some depth of color and shade to your project. I’ll delve more into a color family / shade experiment a little later, along with a sneak peek of some projects I’m playing with. I went ahead and reformatted the list, placing the Coloris color numbers first, followed by the corresponding solid shades. I made the list into a table that’s easy to read, to avoid confusion while shopping, too. I always like thread lists that are easy to read and follow with the eyes, without losing your place! I’m taking this list and sorting out skeins of corresponding DMC solids with each skein of Coloris, along with a few extra shades of the solids, and putting each set (one skein of Coloris plus matching solids) into small ziplock bags and marking them. That way, when I explore some of the little projects I’m working on right now, I’ll have easy access to each group of colors. Keep in mind, I don’t necessarily have to use Coloris in the project. The color groupings work well together as solids, too, so if I don’t want a variegated thread in a project, I can skip it. If I add some extra shades for a couple color families into the bunch, I’ll have a nice project palette to work with, with or without the variegated thread. See how Coloris opens up all kinds of possibilities for project planning? Once I get all the preliminary thread sorting and selecting finished, it’s just a matter of grabbing a bag of colors that appeal and launching straight into stitching. Hope you find the chart handy! I hope that the Coloris skeins will be sold separately soon. Apparently the only way to get them now is to buy the kit for $34 and $10 postage. Much too much for 2 dozen skeins of thread. Walmart will sell it for 34 cents/skein or something. They seem to be priced at the same range as the Colour Variations were when they were introduced. If we’re lucky W*mart will carry it at all, in packages or single skeins. I haven’t been thru one of their sewing/needlwork/crafts departments recently, but IIRC the ones I have been to only carry the solids in singles. I know they’ve never carried regular varigated threads in single skeins, perhaps not even the packages of it. I forgot to add, I’ve had better luck finding new DMC floss at Michael’s. And they often have a 40% coupon. If you have one fairly near, that might be a better option. Individualskeins are available from this website for $1.60 each. 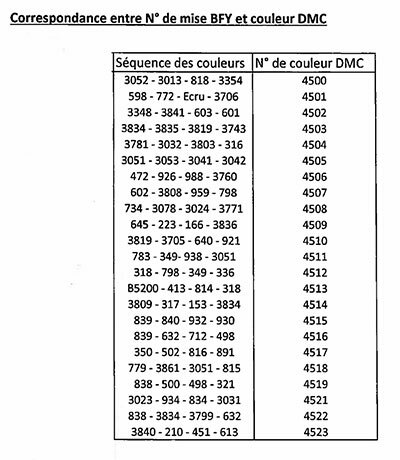 Do you also happen to have the comparison numbers for the DMC Color Variations 4000-4265? I have about half of them but not all. What a good idea to mix coloris and solid colours together, that would work great on many projects. It must have taken a lot of time to match the colours together, but very satisfying on many levels. Thanks for taking the time to make a list of corresponding solid colours to coloris and sharing the list with us, I’m sure this will come in very handy for many projects. I hope they will do this for Soie D’Alger threads which would be really handy for me. Thanks again for sharing the list with us. I hope you are well. I’ve just received my hearing aids (yes it that time of life) and it’s weird typing with the aid on. Thanks so much for the chart! We have had the Coloris threads in our store for a week now, and hadn’t yet found the chart with the corresponding colors. Now if we just had more time to stitch with them! Thank you for the readable list and the ideas for project planning. Looking forward to seeing what you are working on. Yippee! Oh, Mary, thank you! Your version of the chart will be much easier to use. I can’t wait to take the chart to the store and buy some thread. The varigated thread always appeals to the little girl inside me! You are so wonderful to provide that for us, Mary. Can’t wait to see your project! Thank you profoundly for going through all the new Coloris Threads and matching them up with solid DMC colours. That is a wonderful and generous task you have done which will be of benefit to all us stitchers out there. Also thanks for putting it into pdf format. The Coloris threads are not available in our area yet but when they are, I will be buying some and enjoying using them and that colour mix. A job like that takes hours and makes a big mess of thread skeins. I appreciate your doing all that. Mary, the DMC Coloris threads are lovely! I look forward to seeing what you do with them. And these threads have deliciously wonderful names — Juicy Watermelon (156), Autumn Spice (136), Fruit Fizz (139). (http://www.hhtatting.com/results-threads.cfm?SubCategory=65). Don’t you just love color? Thank you! I’m new to your site and am excited to renew my embroidery skills. I love the idea of variagated floss! What a gift! Thank you again. Mary, thank you so much for this!! Thank you for the color chart and the work you’re putting into this. I had not thought about making color palette baggies before, but this sounds like a winner to me and a time saver! Many thanks for your great blog and ideas! Yes, this is handy. I’m very pleased with this new line. Hi Mary, I am doing a weaving course which has shown me quickly how colours interact. Some changes are quite dramatic and definitely not anticipated. Do you do swatches of colour when planning an embroidery project? I usually just reach for colours that appeal to me but I’m questioning if that is the best way to go. Hi, Catherine – I don’t do swatches, per se. I do pick out colors and then fiddle with them a bit to see if they’re what I want. I might work up a little sample of part of the design, for example, just to see how the colors go together. But usually, I just start out with colors that I like, and from there, I start stitching and if a color doesn’t work, I’ll pick it out and try another one! A local (Oamaru, NZ) shop – Enhance – has these threads available separately, I just need inspiration… or more likely, I need to finish a few other projects first. Thank you so much for supplying this list. I have copied it to my computer and also printed out a copy to pin up on the inside of the door of the cupboard where my DMC threads live. Thanks for this, Mary. It is very useful information. I do like your idea of putting the various colour combinations in baggies! I have recently just lost my younger sister with the dreaded Big C! I do feel for you & hope that you can get rid of it once & for all! Good on you for facing it so bravely. It will carry you through especially if you keep faith & pray. Thank you…I think! I was an enthusiastic cross-stitcher in my 20s (a very long time ago!). Reading your posts on the comparison of DMC and Anchor threads has brought so many memories rushing back and has me contemplating picking up an unfinished project. My only hesitation is…what will I put aside in trade for the time! My memories of searching for the most beautiful and perfect pattern for a gift and picking out the required threads are wonderful ones. Thank you, truly! Thank you for sharing your wonderful talent. I stopped embroidering years ago because of my hands and eyesight… you make me want to start embroidering again. Oh, my God! Thank you! I found a design I like for Easter and it uses these color variations and my Michaels doesn’t carry the whole rainbow, just a few colors. Hi, Christine – I don’t have the corresponding color numbers for the newer variations, and I’m afraid I don’t have a skein of that color (4047) to color match with my thread chart. As soon as I get the newer colors, I’ll update that. Previous Previous post: Embroidered Felt Needlebook: An Old Friend, Still Going Strong!